Way back in the fall of 2009, LeBron James seemed to be on top of the world. He had won his first MVP award months earlier, was set to own the NBA landscape as a free agent the next summer, and had put the Cleveland Cavaliers in position to win their first title. Things were so great, in fact, that he planned to take another step towards global icon status by starring in his first film, the working-title-sounding "Fantasy Basketball Camp." With Hollywood mega-producer Brian Grazer on board, the project looked like a slam dunk! As you may have heard, LeBron's public image took a bit of a hit over the next few years. In the 2010 postseason, he disappointed worldwide audiences as the heavily favored Cavs fell to the Boston Celtics in the Eastern Conference Finals. Weeks later, James spurned Cleveland for South Beach during the ill-conceived "The Decision" special on ESPN, and pretty much everyone decided he was a big fat jerk. Production plans for the film were tabled for at least a year, and then put on hold indefinitely when the Miami Heat lost to the underdog Dallas Mavericks in the 2011 NBA Finals. The future of the film, eventually titled "Ballers," seemed unclear, especially when the creative team neglected to embrace my suggestion of turning it into a slasher movie with LeBron murdering the greatest champions in basketball history. 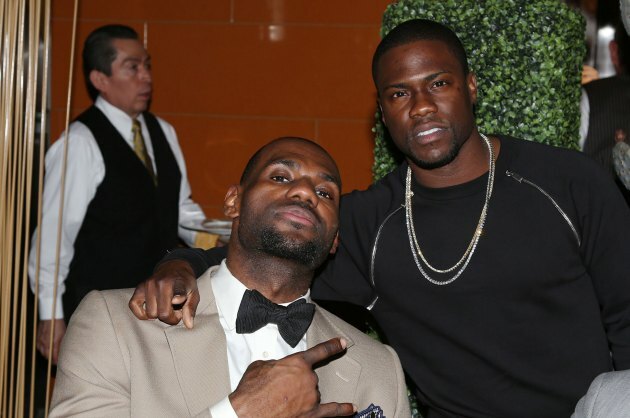 LeBron James’ feature film debut project is heating up again, as comedian Kevin Hart will join the NBA champion in Universal Pictures and Imagine Entertainment’s “Ballers,” an individual familiar with the project told TheWrap. The diminutive Hart may appear small next to James but he’s a big star, with the hit comedy “Think Like a Man” under his belt and the upcoming “Ride Along” shaping up to be a potential franchise at Universal. “Ballers” will find Hart playing LeBron’s brother, who gets a chance to emerge from James’ towering shadow when he attends a fantasy basketball camp in Miami. Hart and James will executive produce with Maverick Carter and Imagine’s Kim Roth. Production is scheduled to start in the summer of 2014. In the meantime, Hart will co-write the comedy with his frequent collaborators Joey Wells, Chris Spencer and Harry Ratchford. Lowell Ganz and Babaloo Mandel were the original writers on the project along with Peter Steinfeld. As noted by Mike Fleming Jr. of Deadline Hollywood, the pairing hearkens back to the beloved 1988 comedy "Twins," in which Arnold Schwarzenegger and the much smaller Danny DeVito played the title pair. Listed at a conservative 6-foot-8 and 250 pounds, James will dwarf the 5-foot-3 Hart in every scene they share. I just hope Hart can handle making jokes about his height. The current iteration of "Ballers" appears to differ from the original idea, with Hart's relationship with his brother LeBron serving as the central premise instead of five friends interacting with the basketball star for the first time. Hart, to his credit, has some familiarity with the NBA, both as a regular participant in the league's All-Star Celebrity Game and from acting alongside Metta World Peace in 2012's "Think Like a Man." LeBron has experience acting as host on "Saturday Night Live" and has a series in development at Starz, but this will be his debut on the silver screen. Here's hoping the opening credits list him as "And Introducing LeBron James." Of course, it might be a mistake to speak of this project as if it's a sure thing. For all we know, James and the Heat will fail to win the 2014 title in embarrassing fashion, with pending free agent LeBron spurning his team for a hated rival in the TV special "The Decision II: Money Never Sleeps." Then Grazer, James, Hart, and their cohort will have to push "Ballers" back again, waiting for a time when the moviegoing public is ready to accept LeBron with open arms. What I'm saying, basically, is that "Ballers" may eventually only get made as a "Last Vegas" ripoff in which 70something retirees LeBron, Dwyane Wade, Chris Bosh, and Mario Chalmers (played by Kevin Hart) return to the NBA for one last crazy weekend before their children put them in a nursing home. It'll be the top-grossing movie of 2050, just ahead of the newest entry in the "Transformers" series.